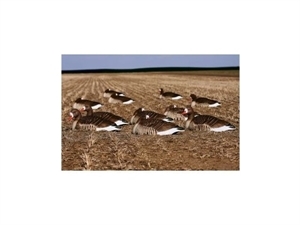 These FFD Elite Life-Size Specklebelly Goose Shells are undeniably the most realistic shell decoy on the market. Perfect anatomy combined with a wide variety of positions creates unsurpassed realism and ultimate lifelike spread. By mixing these shells with your full bodies in the field or floaters along the water’s edge, you’ll create the realistic look that weary late season birds desire. This pack includes 3 Right Feeders Heads, 3 Left Feeder Heads, 2 Semi-Rester Heads, 2 Rester Heads, 2 Sleeper Heads!